Michigan State University defeated Indiana University at Assembly Hall, 74-72, but not before some late game drama and great Tom Izzo reactions. The last weekend of the regular season featured the greatest rivalry in college sports, but it was this Big Ten matchup that made it feel like the conference tournaments had already started. Izzo’s Spartans found themselves up five with 45 seconds left when the Hoosiers decided to start fouling to extend the game. This happens all the time. All Michigan State has to do is make some free throws and everyone gets to go home. Luckily for Indiana the Spartans shoot 63 percent from the free throw line this season, which ranks 334 out of 345 in all of Division I Men’s College Basketball. Indiana fouled and the teams went back and fourth playing the foul game. Fast forward to Michigan State senior guard Travis Trice at the free throw line with five seconds left in the game. Trice makes the first and Izzo calls timeout. Everyone knows without a doubt Izzo told his team to foul WHEN Trice made his second free throw, putting the Spartans up three. Michigan State had been “burned” twice this season when Izzo decided not to foul up by three in the past so he was determined to not that happen again. 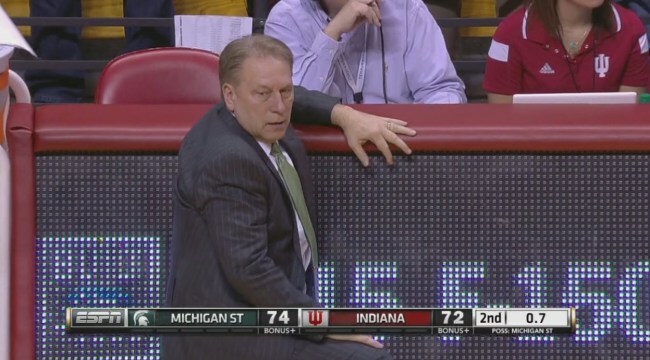 You almost have to feel bad for Izzo. The man cannot catch a break when his team is winning by three points in the final seconds of a basketball game. Junior guard Denzel Valentine does exactly what Izzo said in the timeout and fouls.. except Trice’s miss means Michigan State is only up by two! Indiana junior guard Yogi Ferrell makes the first, but misses the second free throw with less than two seconds left. Michigan State freshman Marvin Clark Jr. missed the first of his two free throws with less than a second left and was told to miss his second free throw with the Spartans only leading by one point. If you didn’t feel bad for Izzo before, it’s almost impossible not to now. Even when literally nothing went the way he drew it up Michigan State still escaped with a solid road win, 74-72. Michigan State missed half of their free throws (5-10) in the final 45 seconds against Indiana, which I believe will be a problem for this team come NCAA Tournament time. As the NCAA Tournament quickly approaches this questions seems to get brought up constantly throughout March. Coaches usually decide which strategy they prefer to go with well before finding themselves up by three points at the end of a meaningful game. Whatever the coach decides to do is always praised when it works and questioned when it doesn’t (that’s the media for ya). My theory on this situation cannot be one simple yes or no answer. I generally think it is better to NOT foul. My main reasoning: your team has a ZERO percent chance of losing. Sure you may be tied after regulation and have to play an overtime period, which may or may not be favorable (see below), but that is the worst case. Fouling when up by three has so many different possible outcomes. The difference in my mind is in this scenario your team, as slim as the chances are, can LOSE in regulation. One way this can happen is the player you are fouling gets awarded three free throws because the referee deemed the player was shooting a 3-pointer. This results in the same outcome as just letting the team take a 3-pointer, except the odds of you going to overtime are much better if the player has three free throws. I simply do not like leaving if I win or lose up to the interpretation of a referee. Let’s not forget about an and-1 where the player makes the 3-pointer, and now you have a chance to lose the game. I would rather the player make a shot than the referee determine the outcome. The other way you can lose is if the offense makes the first free throw, then misses the second and successfully gets the offensive rebound. The ball can be kicked out for a three, and now you have a chance to lose the game. The player who got the offensive rebound could go right back up. Most of the time this will result in a tie if he makes the shot, but what if the referee calls an and-1 and now once again you have a chance to LOSE the game. These are the majority of the outcomes that can happen in the final seconds and I would personally much rather play straight up defense and leave it up to the players instead of the referees. The Michigan State vs. Indiana game mentioned above created another outcome in the scenario: the players do something very human and foul when only up by two. This won’t happen a lot, but there is still a chance of this happening when telling your team to foul. Michigan State was very fortunate to win this game (in regulation) despite one player’s brain fart. Now there are a few factors I would consider that might lead to me changing my philosophy. If my team is a huge underdog and would be better off avoiding overtime at all costs fouling is the best way to accomplish this. If the other team is a terrible free throw shooting team (like a Michigan State) I might foul the right player because then the only way for my opposition to have a chance of winning is to make the FIRST free throw. A bad free throw shooting team has a 50-50 chance of missing the first free throw down by three, which then increases your odds exponentially of holding on to the lead. There are also factors where I would stick with my strategy and not foul no matter what. If my best rebounder fouled out and I am forced to play a smaller lineup compared to my opponent I would not foul. I do not want to take the chance of getting out-rebounded on the missed second free throw. If my opponent is a generally bad three point shooting team I would also not foul and take my chances. While to foul or not definitely is not a simple yes or no answer, a 2010 Harvard study found the odds of winning the same no matter which strategy a coach chooses. This study focused on college basketball, but studies have been run on NBA outcomes as well. A more recent study done in 2013 had a much simpler way of showing the outcomes in each scenario. The win percentage is so close in each scenario that it really is a matter opinion and/or how well your team matches up against your opponent in an overtime. Foul trouble and talent play a role in that decision. As I said earlier most of the time I would tell my team to play defense and force the other team to make a shot. Besides not wanting the referees to have an impact on the outcome I am not okay with preaching defense, defense, defense for the first 39:50 of the game and then in the final seconds basically saying I don’t trust our defense. For a more in-depth and statistically based explanation of whether to foul or not, check out this really well done report by Bill Fenlon at Depauw University here. This entry was posted in Home, March Madness 2015, NBA, NCAA, Playoffs / The Finals and tagged Foul or not, Hoosiers, Indiana Hoosiers, Indiana University, Michigan State, Michigan State Spartans, Spartans, Tom Izzo, Up by 3. Bookmark the permalink.